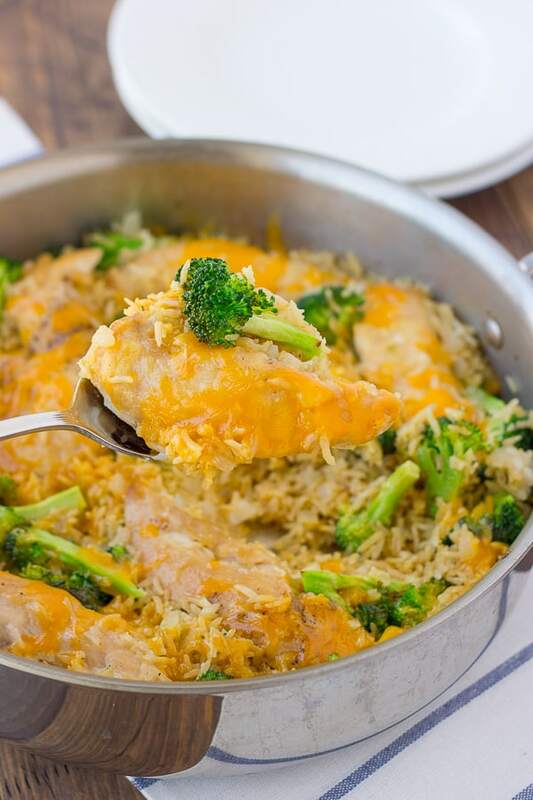 This skillet chicken with broccoli and cheddar rice is a meal that my family and I always come back too. There are just so many things to love about it. It is a one-pan wonder. It takes 30 minutes to make. It is cheesy, flavorful, and made with real ingredients. I love having dinners like this in my repertoire. 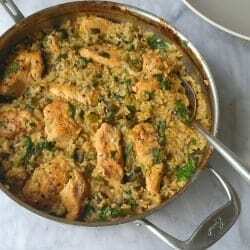 The rice and chicken cook in flavorful mixture of garlic, onions, and chicken stock. Then it gets mixed with lightly cooked broccoli, sharp cheddar cheese, and a dash of hot sauce. 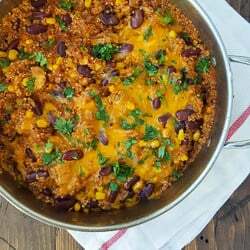 The result is a flavorful, comforting and satisfying meal! 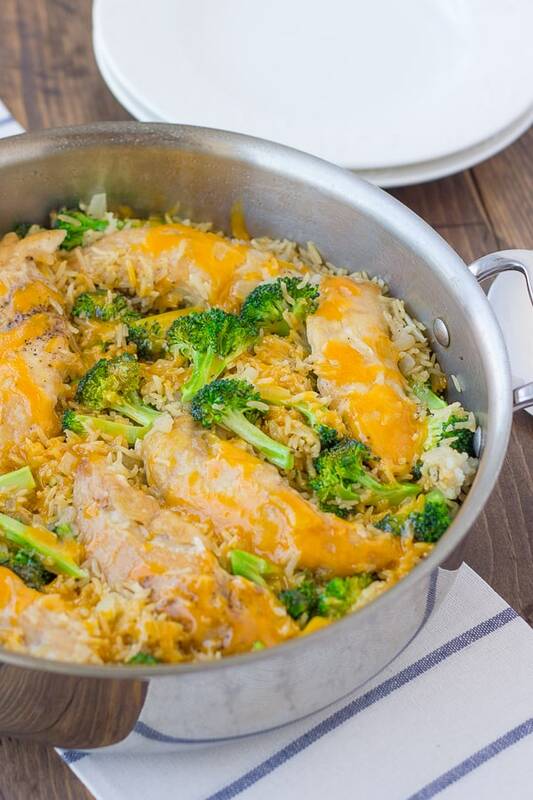 Just like this skillet chicken, this meal is perfect for busy weeknights. It is simple and no-fuss and has protein, a whole grain, and a vegetable all in one dish. My 3-year-old calls this “cheesy rice” and will eat every last bite when I make it, which doesn’t happen with every dinner! My husband loves this with extra hot sauce. A flavorful, family-friendly 1-pan meal! Feel free to add more Tabasco sauce if you like. I love using sharp cheddar cheese for its flavor, but any shredded cheddar will work. Place the flour in a swallow dish. Pat the chicken dry then season on both sides with salt and pepper. Dredge the chicken in the flour and shake off the excess. Heat 2 tablespoons oil in a 12-inch skillet over medium-high heat until shimmering. Brown the chicken on one side, about 4-5 minutes. Transfer to a plate and set aside. You aren’t trying to cook the chicken through on this step, but rather just giving it a little color/flavor. Add the broccoli florets to the now empty pan (adding a bit more oil if needed) along with a pinch of salt and cook briefly, for about 3-4 minutes. Transfer the broccoli to a bowl. Add the remaining tablespoon of oil the pan along with the minced onion and 1/2 teaspoon salt. Cook until softened, about 5 minutes. Stir in the rice and garlic and cook until fragrant, about 30 seconds. Increase the heat to high and pour in the chicken stock. Nestle the chicken into the rice, browned side up. Bring to a boil, then cover and reduce to a simmer over low heat. Cook covered for 15-18 minutes for brown rice, or 10-13 minutes for white rice. 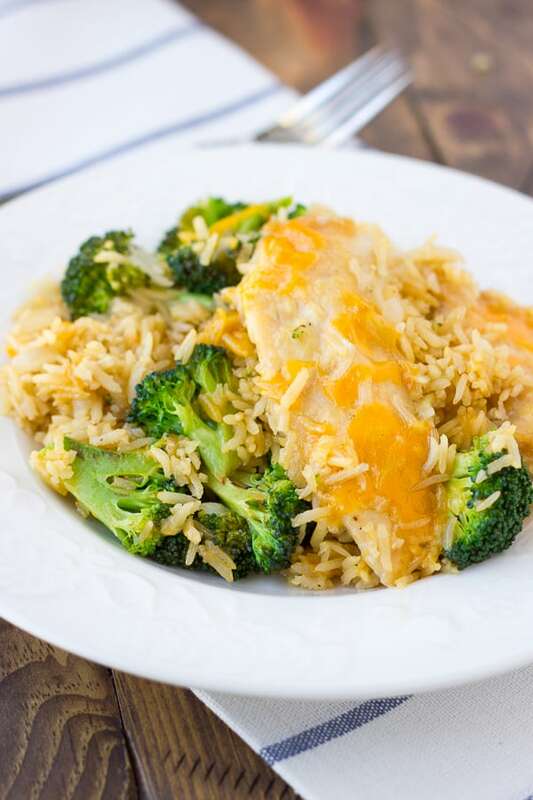 When the rice is done cooking, stir in the broccoli, 1/2 cup of the cheese and the Tabasco sauce. Combine evenly then smooth the top and sprinkle with the remaining cheese. 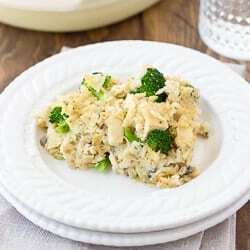 Turn off the heat, cover the pan and let sit until the cheese melts and the broccoli is warmed, about 2-3 minutes. Enjoy! I definitely love this meal. It’s good for dinner and an easy lunch the next day. Thank you so much for this delicious recipe! My husband’s favorite meal used to be the chicken and broccoli dish filled with cream of crap soup. We don’t eat that stuff anymore, so I was very excited to try this. It didn’t disappoint! I used quinoa instead of rice and we loved it! I’m so glad you and your husband liked it! Thanks for commenting back!